In stock 199 items in stock. The Arduino Due has 54 digital input/output pins (of which 12 can be used as PWM outputs), 12 analog inputs, 4 UARTs (hardware serial ports), an 84 MHz clock, a USB-OTG capable connection, 2 DAC (digital to analog), 2 TWI, a power jack, an SPI header, a JTAG header, a reset button and an erase button. There are also some cool features like DACs, Audio, DMA , an experimental multi tasking library and more. Never fear for accidental electrical discharge, either since since the Due also includes a plastic base plate to protect it! If you want to use a shield with your Due, you will want to consider these key differences in communication. This is not a 5V logic board. You will want to use our logic level converter for this board. Software Serial: The Due cannot use the softwareSerial library. Hey Sparkfun! Thank you for making this part!!! We used this part to create the LuminescentGrand, an LED piano that generates light patterns from MIDI. We put it in an acrylic case replica of a mini grand piano. We used P9813 led chipset LED. We have a total of 1700 leds being driven off an overclocked spi data line. We get about 120 frames per second. Tell us what you think using our contact page. Great board, especially if you need four UARTS. Is the Due available without headers? Is this board an official Arduino Due from Arduino.cc or is it from Arduino.org? 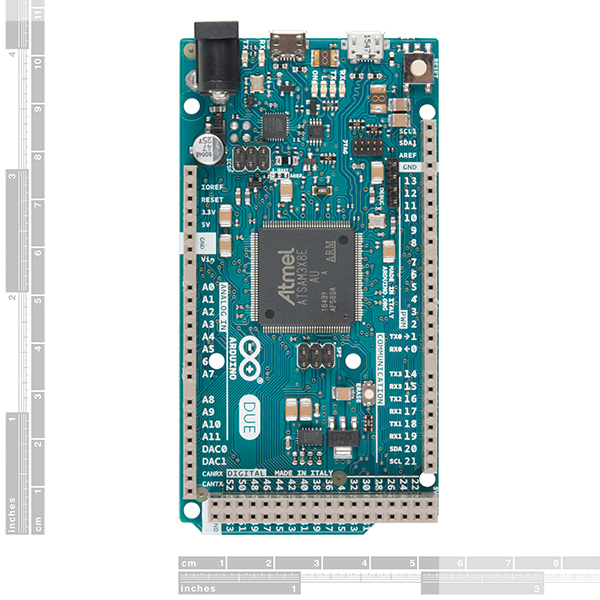 The pictures show the Arduino.org board, and as I understand it, they require a different IDE and some boards have different pin placement between the two companies. This is the official Arduino Due from Arduino.org. Arduino.cc has the Due listed as retired on their website so I don't think they are currently making one. It looks like our links are old, but I'll see about getting them updated. That's the first thing I thought too. The Raspberry Pi has the same issues. It's a complete disconnect for the designers to create something with the Arduino name, yet it's incompatible with existing Arduino hardware. It's actually against the vision of Arduino to do something like that which is what is so odd to me. The beauty of Arduino, for entry level peeps, is that it JUST WORKS - without requiring newbies to read datasheets or specs. Now people have to worry about logic level conversion and such. This is a huge barrier to entry and I would have hoped the designers would have worked that out. They could have at least provided some "protected" inputs which go through the aforementioned logic level shifting. Or at least make some of the pins 5v tolerant with the logic level shifting. People are going to get frustrated very fast if they dish out 50 bucks and the first time they put a DMM probe to the pin to see their pretty 3.3v light up on the DMM and it fries the chip. Not good. What do you mean about frying it with a DMM? I don't see why it would apply a harmful voltage, can you elaborate? My DMM has an LED mode, which applies enough current to light an LED. Does this answer your question? 3V yes, 9V no. For obvious reasons. The problem is as simple as there aren't many, if any, 5V tolerant ARM micro controllers. You use buffers, or level shifters to protect your valuable silicon. They could have made the Due pins 5V tolerant using resistors but that would add to the board cost. Check out: http://ruggedcircuits.com/html/ancp01.html They describe the 10 ways to kill an arduino and explain how to counter each. They make what they call a rugged arduino which can tolerate wiring errors which would otherwise kill a regular arduino. Hopefully they will release a rugged Due. The chipKIT MAX32 by Digilent, 80MHz, 83 I/O'S, using a 32 bit PIC processor is a 3.3v device yet they have configured it so every single pin on the board is 5 volt tolerant! It uses an IDE that is almost identical to Arduino, the basic code is the exact same. They have an UNO and a Mega size one, for $25 and $50. Great little boards, love mine! Check them out, they may be what you need to hold you over for a while. LLS for 50 pins would be prohibitively expensive, on all three fronts (cost, size, power). And LLS'ing only a select few pins would likely result in MORE confusion than there currently would be. Instead of only having to remember "don't use 5V", I have to remember "Use 3.3V on pins x..y, and 5V on pins p..q". Better to just ban something completely than only half protect against it and rely on people actually remembering what pins do what. You make a good point, but I'm just afraid a LOT of people are going to fry their Due's, in due time. Sorry for the bad pun :). I also just read that the device can only source 130ma total. That's almost half of what the ATMega328 can source total. This chip is not even close to the durability of ATMegas, which is one of the great points of Arduino - I've WASHED a chip before (as in I had it in a pocket of my pants and I washed those pants in the washing machine) and it ran fine afterwards (after thoroughly drying it for a couple of days). I'll stick with my Raspbery Pi. Half the cost and more functionality. Washing is nothing special. Commercial boards are always washed (in everything from a specialized washer to simple home-type dishwashers) after production. If the chip didn't work after being washed, then it wouldn't be fit for commercial use. And, if you Raspberry Pi has more functionality (unless you define functionality as clock speed) than your ATMega, then you're doing it wrong. That statement was confusing. Are you saying that an ATMega should have more functionality than a SoC using a Broadcom GPU and an ARM chip? There are limited GPIO ports, sure, but an ATMega 328p doesn't have that many either. I can also buy or make an I/O extender. Maybe you haven't used a Pi yet. You can run Linux on it. Yeah. Try that with a 328p. Just to clarify, one can't really compare the raspberry pi and arduino due directly. They're designed for completely different tasks. The raspberry pi has far greater computing power, but lacks a real-time operating system and has few GPIO pins. It's suitable for running computing-intensive tasks like image processing and the like, but not for doing time- and position-sensitive tasks, like driving the head of a 3D printer. The arduino due, on the other hand, serves as a compliment. It has plenty of GPIO's, runs instructions in a set order, in a predictable time, but does not have as much processing power. This makes it excellent for the tasks where the raspberry pi would fail. On the topic of the durability of the arduino due, i feel like beginners should be given more credit. They're not stupid, and descriptions of the due make clear its limitations. Is it more fragile? Yes. But the increased capabilities are totally worth it. I don't see why Arduino used an Atmel 32-bit MCU, as the Maple uses an STM part which is (mostly) 5V tolerant except for the Analog pins. It won't stand up to the pin/port drive of a Atmega (not much does these days), but it may have been a step in the right direction. 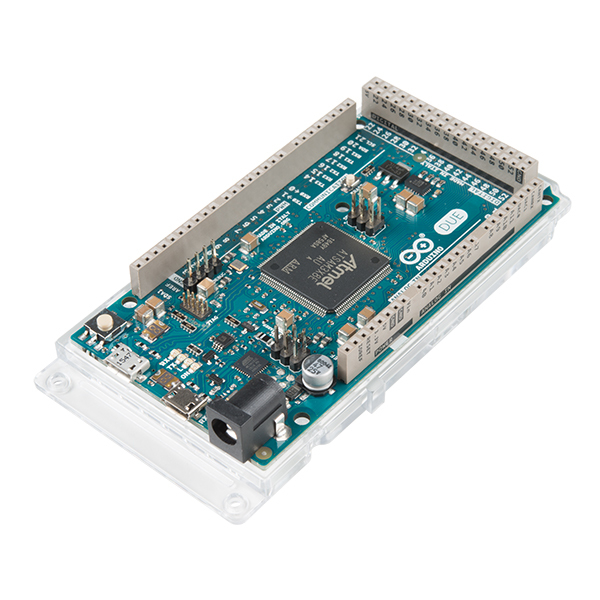 Note: Unlike other Arduino boards, the Arduino Due board runs at 3.3V. The maximum voltage that the I/O pins can tolerate is 3.3V. Providing higher voltages, like 5V to an I/O pin could damage the board. 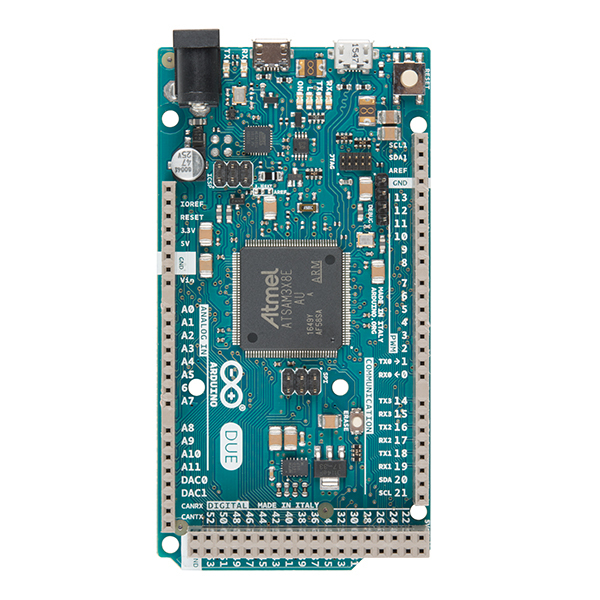 Note: Unlike other Arduino boards, the Arduino Due board runs at 3.3V. The maximum voltage that the I/O pins can tolerate is 3.3V. Providing higher voltages, like 5V to an I/O pin could damage the board. Note: Unlike other Arduino boards, the Arduino Due board runs at 3.3V. The maximum voltage that the I/O pins can tolerate is 3.3V. Providing higher voltages, like 5V to an I/O pin could damage the board. Note: Unlike other Arduino boards, the Arduino Due board runs at 3.3V. The maximum voltage that the I/O pins can tolerate is 3.3V. Providing higher voltages, like 5V to an I/O pin could damage the board. Can I get an ETA? Would be nice, since every time I check its on back order. When are these things shipping? Adafruit had them in stock, they're gone now. I'd assume Sparkfun would have them soon. A pretty good product. I bought it mainly because it had analog outputs, the lack of which I've always found to be a significant limitation on the other Arduino models. However, users should be aware that the analog output does not span the range from 0 mV to 3.3 mV. It cuts off the bottom 1/6 and the top 1/6. That is, the true analog output range is between 0.55 mV and 2.75 mV. The documentation does not highlight this point, but it should. After buying the Due, I was unpleasantly surprised to find this out. Quick question regarding the DUE and the DAC. I want to hook up the DAC output of my DUE to an STA540 (I bought the kit), but I was concerned since the DAC outputs for the DUE seem especially sensitive from what I'm reading around the web. I'm pretty sure the opamp at the input of the kit has a fairly high input impedance so I doubt it draws a lot of current, but I want to make sure before I hookup my $50 due to the amplifier and blow my DAC output. I've tried unsuccessfully for three nights in a row to get something to play through an lm386 circuit, but no joy. I know the DAC is working though because I see a nice 440hz 1.2vpp sine wave on my scope when I probe the DAC (I've got a DDS running on the DAC which is generating A4 which is 440hz). 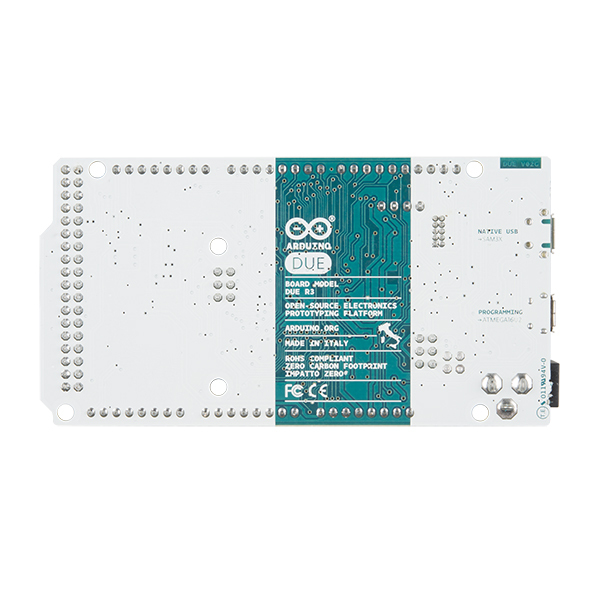 Quick question - how does this board compare to the new Arduino Zero? Ok I'm looking for some help or an answer: I just realized that the Arduino Due pin spacing between the header with 8-13/GND/AREF/SDA1/SCL1 and the header with pins 0-7 are not aligned so one could use a 0.1 inch PCB as a shield. All other headers are aligned so it is possible, but its just the one with pins 8-13/GND/AREF/SDA1/SCL1 that does not fit. Any reason why? Is the Mega like this? Are they any 'proto-shields' that will work for all pins on this board? I believe this is actually an error from the first Arduino boards ever. From what I understand the error was caught, but not in time to make a change before sending the PCBs out to be manufactured. So every official Arduino has that spacing, and all Arduino shields will as well. That's interesting. I just found out my Unos are the same way. Not sure why I never noticed this before. I assume they won't change this and I'll have to buy proto shields with the correct header spacing. At least they are not that expensive. So can this thing multitask? I am trying to connect both the SM5100B cellular shield (serial 3 on Due) and a puprletooth jamboree bluetooth module (Serial2 on Due). When both are connected to Due only the BT module works and the cellular shield stops responding. Both are connected to an external power source. Any idea as to why? Is the board unable to drive both together? How can this be solved? You can program this using a micro-B USB cable. I need use a Touchscreen LCD with my arduino due, I already choice the LCD-11741 but is 5V input and itÂ´s out of range from 3.3V output from arduino due, somebody has any sugestion?? Would anyone mind posting board dimensions? I don't see it here or on the arduino.cc site. --nvm, forgot about the rulers image :) thanks sparkfun! I would love to have this in the same format as the pro mini. Hello, I got my DUE board a week ago and tried its I2C connection but it is not working and when i browsed a little and i find out its not only my problem. how can YOU start selling a product without verifying?Is there any solution to that problem? Question 1: What module are you trying to interface to the Due? Is it a 3.3Volt compatible device? Just wanted to warn everyone about some manufacturing quality issues that I have encountered recently. I received a Due in the mail last week, only to find that there were shorts on a couple of pins on the JTAG connector. The 3.3V plane also had a low-resistance path to ground -- but I didn't see any obvious shorts anywhere. I sent back the board to Sparkfun and they sent me a new one. I pulled it out of the box and AGAIN noticed that there were shorts on the JTAG connector --confirmed with the multimeter. Now either I am just incredibly unlucky to receive two boards with the same problem or there are some quality issues in manufacturing. There is a chip sitting between the 3.3V line and ground. The chip will allow a small about of current flow. Whenever I check the resistance between Vdd and ground on most electronics boards I see a few K ohm of resistance. This is normal. It's not a short, it's a circuit. Did you even check to see if your board worked before returning it? Perhaps you could be specific about your findings (what pins are shorted to where). Keep in mind there are capacitors on board which could alter actual readings from your expectations. (example: measuring resistance of certain pins with capacitor will end up charging the capacitor unintentionally and won't read correct resistance). Does your board not work? How this compares to chipKIT Max32 ? Ok, so who b0rked the supply chain? It all seems a little beyond laughable to launch a shiny new product and not have supplies for this long. I'm looking at you Arduino. Happy to be a patient customer but some info to help set expectations would go a long way here dear SparkFun. Anyone know how far away before we can get a bootloader to burn our own chips? I can share information, where you can purchase DUE (at this date) in continential US, if SFE admins allow me to do so, I don't want to take their business away, but for those who's impatient like me, again, only is admins say I can do so, so please say something =) Side note, LOVE SFE! I have now two Dues. The uploading speed is little bit slower than on normal Atmega 328 based Arduino boards. Otherwise it works like a normal Arduino board. Bossac is really nice uploader I think! I don't see a reason why you couldn't. Just don't read the file and stop the DAC conversions. Please be aware it requires a special USB cable! It does? Pretty sure it's just regular ol' micro USB. What special cable do you believe it requires? Perhaps he meant for the USB OTG port? That would require a full size A female socket to micro-B. According to the Sparkfun USB Buying Guide, it also requires a micro-A to micro-B. I think the Sparkfun Female-A Socket to Micro-A adapter cable is what I want. Wouldja looket that, they even have this fabled, super special Micro-B USB cable in the related products section! Such service, SparkFun! It does not, I have about 3 of these cables lieing around on my desk. Any idea went it will be available?? When I saw that it had a 32 bit CPU, was I the only one that thought "Linux on Arduino, yes please". Especially with the USB capability. Forget it. The SAM3 has no MMU, so no Linux. uClinux would even be a really tight squeeze. It will run at 80+MHz as it has a PLL, and it is very accurate from a 12MHz xtal, certainly not +/- 10%. Read the datasheet. I agree. As much as I enjoy seeing the new Arduino progress, I have been a little worried that this (Arduino Due) could affect leaflabs adversely. I have really enjoyed creating maple sketches. I appreciate the super fast math and high resolution PWM (16 bit) and analog to digital conversion (12 bit) on the maple. The leaflabs web documentation is very good. I hope things continue to progress and go well for them as well. Wow. I didn't know this was in the works. Very cool! I've been creating a new data acquisition system using the Leaflabs Maple (which is very similar to the Arduino Due). If past performance is any indicator of future trends, there will undoubtedly be a Sparkfun miniature variant! What would they call it??? Will there be a Sparkfun pro Due? There was a mini, there was micro, it seems inevitable.... whatever they call it (neutrino sounds good to me) I'm sure I'll get one immediately. What do you say sparkfun? Just do it! A USB host. For connecting keyboards and thumbdrives and stuff. Really?. Whoa. I think this has taken Arduino from a Easy-To-Use hobbyist level and thrown it through a wormhole to high-level designers. What will the next generation of Arduinos look like? X64 PCs with AMD A8-3870Ks? This isn't going to replace the Uno or Leonardo though. It's a more advanced board for sure, but the other Arduino boards will still stick around. I think it is good that Arduino is starting to cater towards the higher level applications, while still retaining that intuitiveness for beginners. I tried to view the eagle files for the board... but both the schematic and board files are corrupt. Anyone else have this problem? might just be you. worked fine here at work and from my netbook at home. Already have my Eagle files done, but as a previous poster pointed out, it's going to be prohibitively expensive to LLS all 50 pins. The BOM for my board is running about about $35 just for the components (retail prices, but bulk would be between $15-$20 per board). I wouldn't spend upwards of $50 on a breakout board that just did logic level shifting. In my opinion the better approach is to just go 3.3v all the way (again, the previous poster recommended this) and just breakout those pins that MUST interface with 5v logic levels and just use a stand alone LLS for that. Basically treat 5v logic levels as exceptions to the rule. Hmm... Think it would be possible to do level shifting with nothing but zeners? Taking that approach it would be possible to use a Mega sized protoshield, like the one Sparkfun sells, and add transistor based level shifting to the pins that are needed. Although it would probably be more expensive than a purpose built level shifter shield if you are doing it for 30+ pins. Very interesting. I'm building a pair of robots, and a month and a half ago when I was ordering all my hardware, I specifically went with a Digilent chipKit UNO32 and a chipKit MAX32 because I wanted a faster, 32 bit core. Seeing this... I think I'm still glad I did. All of the I/Os are 5v tolerant on the chipKits. I'm just curious if the I/Os supply as much current as a ATMEGA based Arduino. The chipKits only supply about 12mAh per I/O. So how will the toolchain work with this? The arduino software (for windows) has a built in winavr distro that is uses (when uploading a project, or verifying, turn on verbose mode to see this). Since winavr is a well known and well tested product I am very confident with it's performance. It might not be the fastest beast on the market, but it works. Now, ARM is a completely different beast. I have successfuly cross compiled arm-none-eabi on Linux (still working on Cygwin, but that's a side/side/side project), but the only cross compiler toolchain I am aware of for Windows is Code Sourcery and now that Mentor Graphics owns it I'm not sure of the licensing (though they should probably keep the GNU license). This isn't a problem for Arduino, since it's open source already. I am working on a very similar project for Windows right now, which is why I ask. If this bad boy is going to use the Code Sourcery tool chain then I'm all in (and will happily grok the toolchain from the Arduino install, just as I have WinAVR). Arduino 1.5.0 IDE is apparently in Beta, but it's the IDE you would use for the Due, and you can give it a test run using any other Arduino. They've done a little bit to change the IDE, so probably a good idea to give it a spin before your Due arrives. But, for the most part, the environment/syntax for the Due is the same. The Due has some added functionality, so I imagine we'll see some syntax that's Due-specific as well. I'll download it and give it a peek. I'm hoping they have a arm cross compiling toolchain for windows in the package :). You could try YAGARTO (http://www.yagarto.de/) which is what I use for Windows/Mac. That's a fast clock speed!!! But why 3.3v instead of 5v? 5v is going the way of the DoDo. Why wouldn't you want to consume half as much power (or have twice as much power available?). For the same power rating at 3.3v you can increase your current by over 150%, or with the same amount of current you can consume 66% less power. I'm wondering if your math is a bit off here - when drawing the same amount of current, you're now using 1.7V * I less power than the original 5V * I, which is 34%, not 66% less. Of course you could have just meant to say "consume 66% as much power." The dissipation in a logic IC like a microcontroller is mostly resistive, that means that power is quadratic with voltage. 2/3 the voltage is 4/9 the power. So, yes, moving from 5V to 3.3V is more than a 50% power reduction. But does the board still allow use of 5v sensors? Is that the reason there is a 5v pin on the board? I'm still waiting for 1.8V to become the standard. It would be very difficult to implement market wide, but i would love to have everything running off a single battery cell instead of a battery pack, though the 3.3v and 5v dc-dc step-up units Sparkfun sells are helpful. May I introduce to you....Lithium batteries. (facetious, not pretentious. I'm just joking. But LiCo has a 3.6-3.7v nominal voltage (depending on if it's general or polymer lico). Of this I'm aware, and i enjoy salvaging batteries from old laptop packs, I just don't like having to add extra components to a board when a nimh cell would charge just dandy off USB, or toss it in the AA chargers i have laying about. I've got real time multitimbral polyphonic DDS working on this bad boy with both DACs outputting composite waveforms! I love this beast! The Uno, micro, Redboards work well for simple little projects. But when the program code grows long... say 1000 lines, and you need to use a lot of variables while also trying to format the data for output. The smaller boards just don't cut it. You can spend a lot of time fighting trying to make things fit. Or just to to a board that has more program and data space available. The speed helps also! The extra A/D channels provide more flexibility in the sensors. The large number of digital I/O ports and the faster speed mean that I can setup MULTIPLE I2C buses that operate independent of each other. The extra serial ports mean you can collect data directly from devices that are serial only - while still being able to ship the merged, time-stamped data out the USB serial port on the board. These work great! Same familiar Arduino environment, but a whole 'nother world in terms of processor performance. Compared to regular Arduino it is blazingly fast and has huge memory. We use it to run a pretty demanding real-time motion control project. After initial frustrations with installing the appropriate drivers and configuring appropriate ports, this board has been seamless transition from Arduino UNO. Arduino Due forums are a great place to get advise if you are experiencing programming issues. Great microcontroller. Has one hardware bug that can be annoying, but overall I am impressed. Not much to say, has been very solid up to this point. Tried to use the Due to run a hefty i2c task as the Uno was a bit too limited (memory-wise); however, the Due proved to have many problems that were very difficult to fix. Arduino needs to do more work on making this a commercial product as we ended up switching to a PSoC board where we wrote custom firmware. Anytime you write custom firmware as an easier solution to using a commercial product, you know something is off. Sometimes when attached to nothing but a USB cable to the programming port, it will emit a faint irregular squeal, and act bricked. However, if unplugged and re-attached, it is likely as not to work just fine, and not make any noise. I am not sure what is wrong with it, or it might even be my cable? Otherwise, this board has a great feature set, and I have used these boards before with no issue. It may be the power supply (SMPS units can create a high pitched noise), or the cable, There's also a chance that it's a capacitor. Make sure you're using a good quality cable, but if it persists, you can always contact our tech support team for further assistance. SUPER POWERFUL UPGRADE FROM Arduino UNO!! I'm using the Due with a custom PCB that I created to send via bluetooth the time between inputs on 12 input ports. The signals come randomly as fast as 40 per second - on each input. Add logic to the processing and it works. I've put somewhere in the neighborhood of 10 of these into production environments in the past two years. I've been pleased with them. NOT WORKING AT ALL !! The board arrived in working order and I ran a blink test, to ensure that the compile and upload functions were working. What I did have to work at was finding a version of the IDE which would recognize the Due in the Boards Manager. It turned out that version 1.5 was Ok because apparently the Due board definition was incorporated into the IDE definitions. Versions 1.62 and 1.63 however, gave me continuous errors every time I launched the Boards Manager (unable to connect to the internet). Finally I found that version 1.6.5-r2 works with the board manager and with this IDE I was finally able to load the Due Board and work with it. I hope to use the fast ADC's and large SRAM to record geophone data. I purchased this board because the documentation states that you can set the input and output resolution to 12 bits. I needed this for PWM output. Once the output resolution is set to 12 bits you can count up to 4095 but the PWM signal only changes every 16 counts.